Imtech Marine & Offshore has been awarded the contract by Turkish Defense organization for the delivery of an extensive Integrated Platform Management System for the First of Class of the New Turkish Navy MILGEM Corvette. Imtech Marine & Offshore has been awarded the contract by Turkish Defense organization SSM for the delivery of an extensive Integrated Platform Management System (IPMS) for the First of Class of the New Turkish Navy MILGEM Corvette. Imtech will execute this program together with its Turkish partner YALTES and will be the first candidate to supply the same system on the remaining 11 vessels. YALTES will be the main contractor for this project while IMTECH will provide the technology and system integration. The MILGEM Corvette, from the Turkish words Milli Gemi (National Ship), has an overall length of 324 ft. With a displacement of 2,000 tons and 11.8 ft design draft, it will be fully operational up to sea state 5 and be partially operational at sea state 6. The main propulsion system consists of one gas-turbine and two diesel engines (CODAG). The maximum speed of the ship will be 29+ knots with a propulsion power of approx 30.000 kWs. The corvette has been designed to operate with 93 crew, including personnel for flight operations. 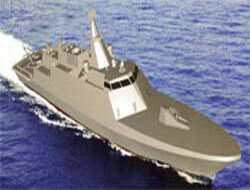 The Turkish Navy plans to build up to twelve of these new multi-purpose Corvettes of the MILGEM class. Construction of the first MILGEM class corvette is in progress at the Turkish Naval Forces Istanbul Naval Shipyard and is scheduled to be operational in 2011. Imtech’s UNIMACS 3000 series Integrated Platform Management System (IPMS) will be used to monitor & control all platform machinery, electrical power generation & distribution, damage control and auxiliary systems.